Russian media are famous for biased coverage of politics, especially regarding the war in Ukraine, led by insurgents and backed by Russian military. Many Russians see the war in Ukraine just as a minor episode of a greater geopolitical conflict – the one between West (civilized world) and East (Russia). Thus, the humanitarian catastrophe in Donbass and thousands of lives of local population and soldiers do not matter. In video bellow, Russian journalists discuss so-called “parade” of Russian troops to Warsaw, Berlin and other European capitals. Initially, I thought, the program is a kind of John Stewart’s “The Daily Show”, but those journalists pretend to do reporting – discussing the scenarios of the future preparations to May 9 celebration – anniversary of the victory in the World War II. Meanwhile some pro-Ukrainian activists prepared subtitles in the video to target the international community. Second video shows insurgents in Lugansk regions addressing to public on the eve of Orthodox Christmas. A girl sends best wishes with Christmas and hopes for the victory in a fight against Ukraine. “But if we gonna loose, we will blow the world”, – she says to threaten the world with nuclear blast. That’s how the creativity for so-called “ruskiy mir” (Russian world) works. Information war against Ukraine run by Kremlin-backed media is supported by pro-Russian puppets, employed by Russian strategists. The recent evidence of this scheme leads to Dragana Trifkovic, a 38-year old woman from Serbia, who joined other foreigners on so-called LNR and DNR elections in Lugansk and Donetsk temporary occupied regions on November 2, 2014. 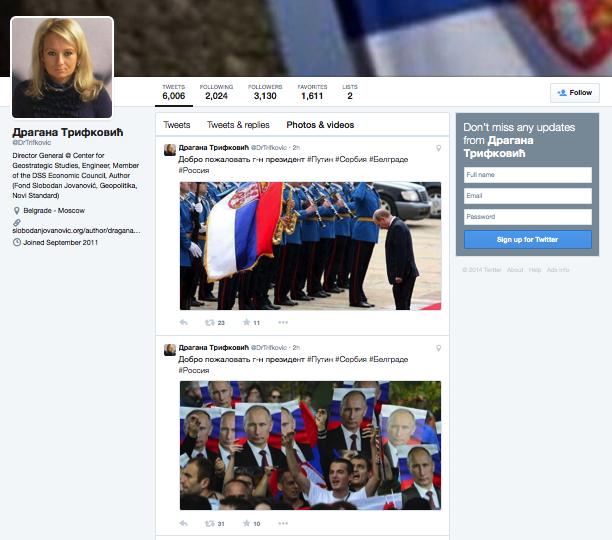 As a Serbian citizen, Trifkovic left many traces of her visit to Donbass via social media – she was posting photos of her meetings with Russian terrorists in Donetsk and Lugansk regions. 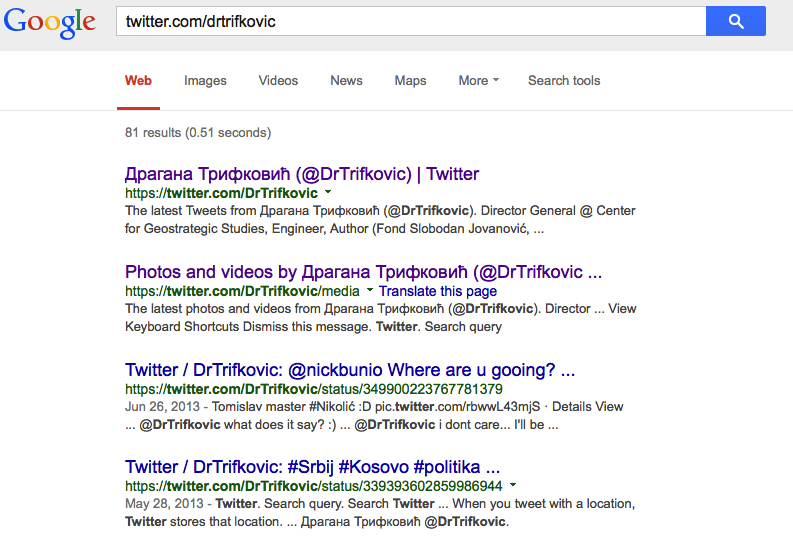 Known as a supporter of Russia, Trifkovic was linked to neo-Nazi Russian groups and was heavily commented in Twitter. Serbian “expert” might have different reasons to love Putin, but her links to neo-nazi groups in Russia question self-proclaimed good intentions of so called LNR and DNR authorities. Anton Shehovtsev analyses in his blog. Kremlin will employ puppet “election monitors” that will “observe” and legitimise the “elections” held by the terrorists. Evidence suggests that two “election monitoring organisations” have been in charge of setting up the “election observation missions” for the DNR/LNR: the Eurasian Observatory of Democracy and Elections (EODE) run by Belgian fascist Luc Michel and the European Centre for Geopolitical Analysis (ECGA) run by Polish far right politician Mateusz Piskorski – both have been in the service of the Kremlin’s foreign policy since 2005-2006. Trifkovic describes herself as a Director General of Center for Geostrategic Studies in Belgrade and claims she is an author at some Serbian sites, such as Fond Slobodan Jovanović, Geopolitika and Novi Standard. Seems, the intellectual level of Serbian elites is quite low if such experts represent Serbian think tanks. 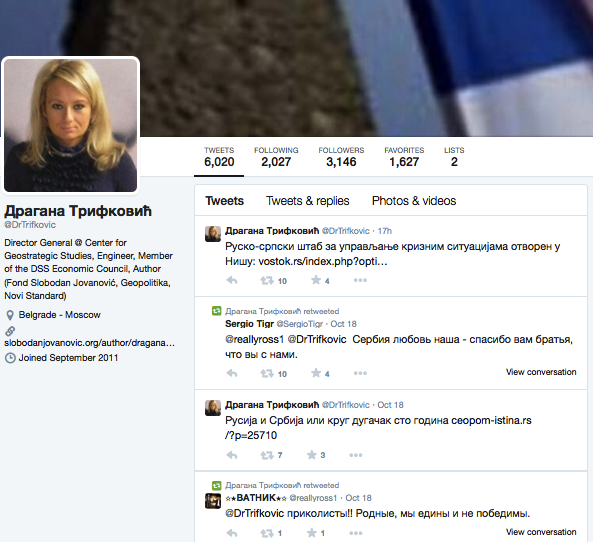 Hashtag #russiainvadedukraine was suggested by a student from Belarus who writes by the name @belamova in Twitter. As a result of awareness campaign by Twitter users to inform international community about Russian direct military invasion into Ukraine, the hashtag appaared in Twitter world trends. 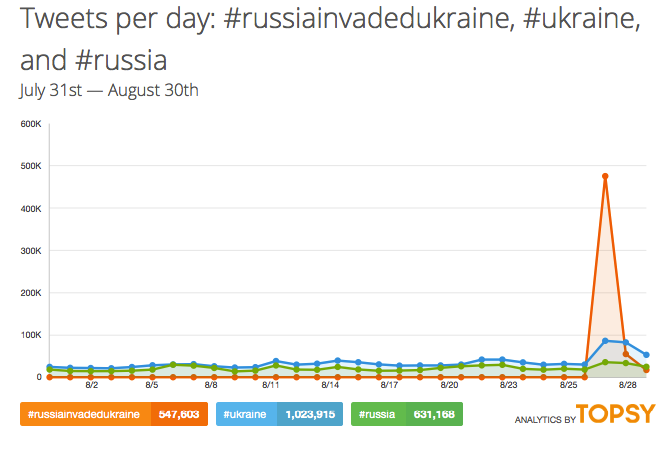 According to Topsy data, almost 500,000 tweets with #russiainvadedukraine have been published between August 26-28, 2014. Ukrainian politicians, such as Prime Minister Yatsenyuk and Minister of Foreign Affairs Klimkin used the hashtag in their tweets. 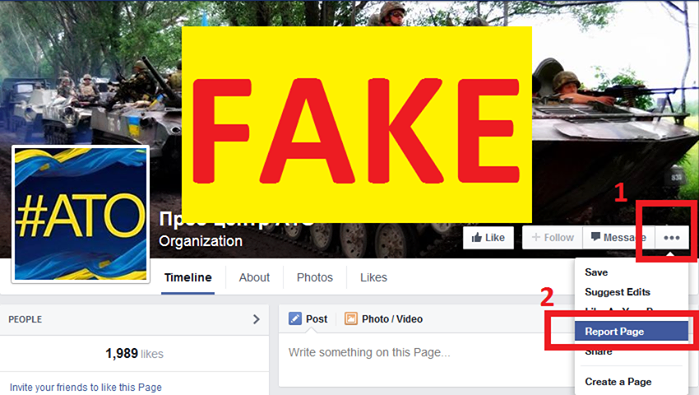 Pro-terrorists users have created a fake Facebook page for Press-Center of Anti-terrorist operation in Ukraine to misinform users about the Ukrainian army fighting against terrorists in Eastern Ukraine. By layout the fake page is identical to the official one – it has the same cover photo, avatar and mission statement. Many pro-Ukrainian users liked the fake page, in particular 13 my Facebook friends did. While official page of Press-Center of Anti-terrorist operation has 52 300 fans, the fake one – just 3800 fans. The fake page was launched on July 16, 2014 and publishes pro-Russian news and updates from the terrorists – the creators chose the tactic to repost statuses of Russian pro-terrorist users containing propaganda and misleading information. On August 5, 2014, influential page Euromaidan SOS published a poster to bring attention to the fake page. Many users have submitted appeals to the Facebook abuse team but meanwhile the page is active as of July 13, 2014. Also, Pro-Ukrainian users publish warning messages on the wall of the fake page and in comments to each of its post. 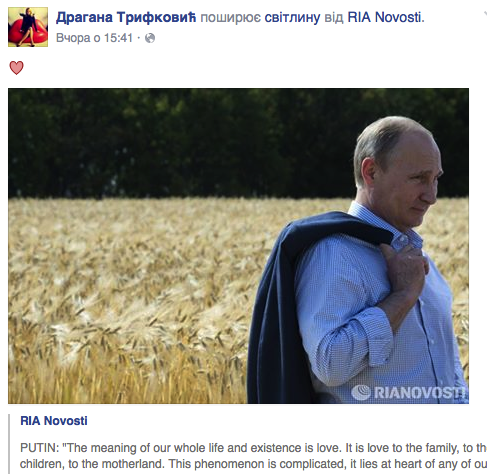 The launch of such fake page might serve another evidence of the Russia informational war against Ukraine.